It’s April, 1916. Dublin GAA footballer Frank Shouldice has just won the Croke Cup. It’s a big achievement, but he has other things on his mind. Two weeks after the final whistle he’s on a rooftop in North King Street with a rifle in his hand. His cheekbone is grazed by a bullet smashing into the wall behind him and, according to a confidential military file, Frank Shouldice is killed in action. Except he is very much alive. His brother Jack commands the barricaded street below. In some of the heaviest fighting of the Easter Rising the South Staffordshire Regiment can’t budge a pocket of Irish Volunteers defiantly holding out. Through the sights of a borrowed pair of binoculars Frank takes aim from the Jameson malthouse high above. The street is soon littered with casualties and the British troops are forced to withdraw. Pearse’s surrender begins the next chapter of this extraordinary story. In the eventful years that follow, Frank, formerly a civil servant, will spend jail terms in Stafford, Brixton and Wormwood Scrubs. When he gets home to Ballaghaderreen, County Roscommon he is placed under surveillance by MI5, the military and police in Ireland. He is court-martialled in Frongoch internment camp and incarcerated at Usk Prison in Wales, where he leads a daring four-man escape to freedom. But he didn’t like to talk about it. And when Ireland’s War of Independence descends into Civil War he lays down his gun forever. 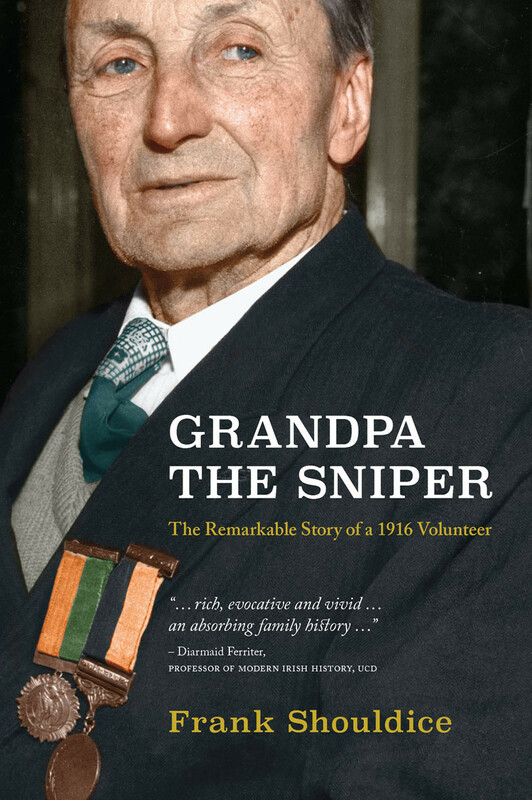 Drawing on prison letters, personal diaries and secret military and police files, Grandpa the Sniper retraces a remarkable journey by a reluctant hero. Part biography, part memoir, it offers readers a rare insight into one of the quiet men who gave their all for Irish freedom. Frank Shouldice is a writer, journalist and dramatist. He has produced and directed a number of documentaries for RTÉ’s Investigations Unit and for Prime Time, including ‘Jobs Abroad’, an exposé on the international recruitment business; ‘Riches from Rags’, on fundraising for charities; ‘Untouchables’, on diesel smuggling; and many more. He has written widely about social issues and sport, and has been published extensively in Ireland, the U.S. and Australia. He also writes and directs for film and theatre and has had stage plays produced in Dublin, Belfast and Glasgow. He is currently collaborating with the War Theatre in Sarajevo on a co-production of his forthcoming play Beneath the Cedar Tree.